Since I live in Burnaby, one would assume that I would stay put for the convenience of it all. Alas, I try to avoid some parts of Burnaby if I get the chance. 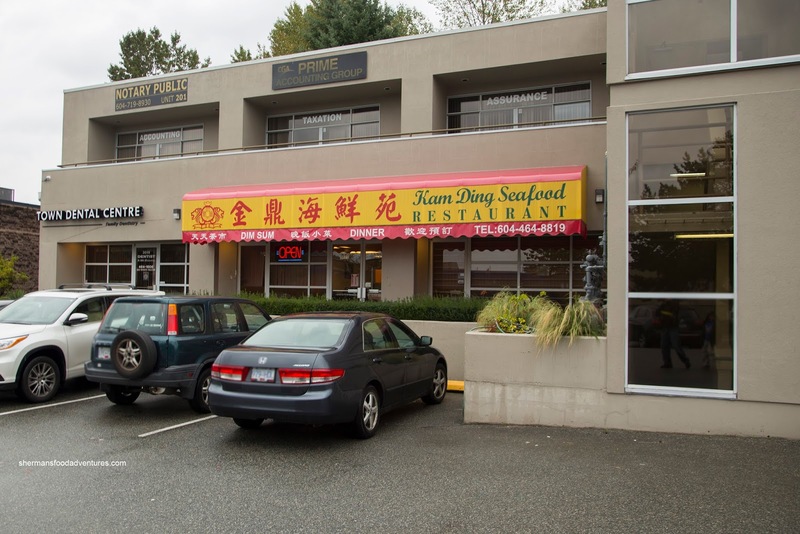 Despite the prevalence of food in and around Metrotown, my desire to actually head in that direction would be as low as spending an overnight at my mother-in-law's house. 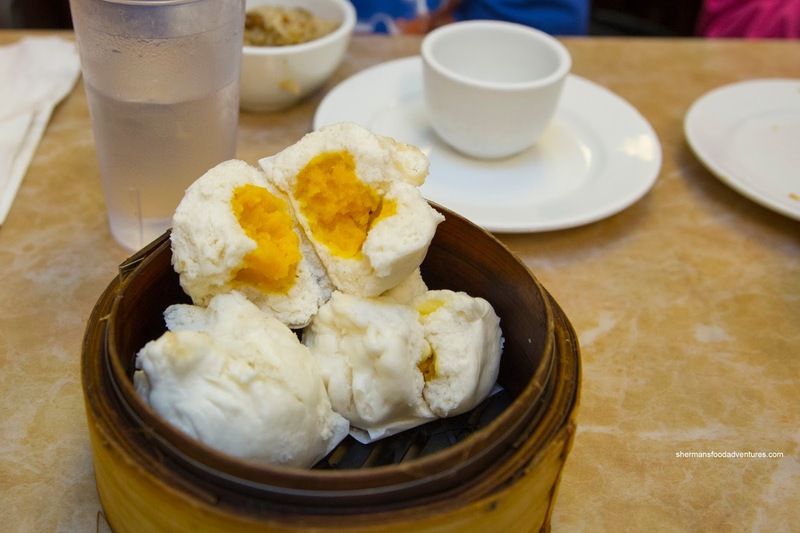 Hence, when we wanted to do some causal Dim Sum, we went East towards Coquitlam instead. In actuality, despite the being farther away, it takes the same amount of time for us to get to Coquitlam Town Centre as it is to get to Metrotown. 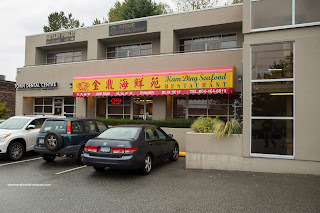 We ended up at spot we'd not visited in 4 years in Kam Ding Seafood Restaurant. Since they still employ push carts, we practically got all of our food immediately. Starting with the smallest Shrimp Spring Rolls I've ever laid eyes on, they were pretty mediocre. The exterior was crispy, but the filling was mealy and lacking any real texture. It was well-seasoned though. With push carts, there are times when we order something that we normally wouldn't choose. 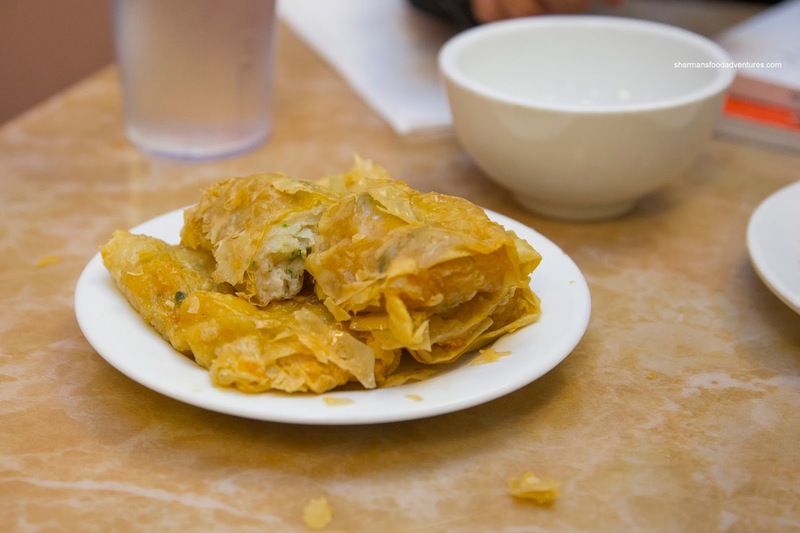 The Fried Bean Curd Skin Rolls was that dish. It was crispy and slightly greasy with the same mealy filling. Again, it wasn't lacking in flavour though with a noted sweetness. 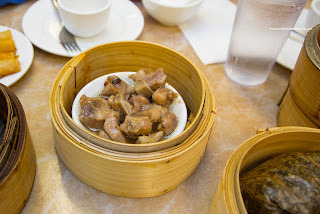 Onto 2 steamed items, we were a bit disappointed at the portion size where we could see the bottom of the plate. In terms of execution, the Black Bean Spareribs were decent. The meat was a touch dry, but exhibited the classic rebound texture. We found it to be mildly seasoned with only a touch of saltiness. As for the Honeycomb Tripe, it was not very good. There was a noticeable gaminess that was probably the result of improper rinsing. Texturally, the strips were meaty with a chew. I much prefer a more buttery chewiness rather than this one as it felt almost dry. Other than the gaminess, the dish was quite sweet. 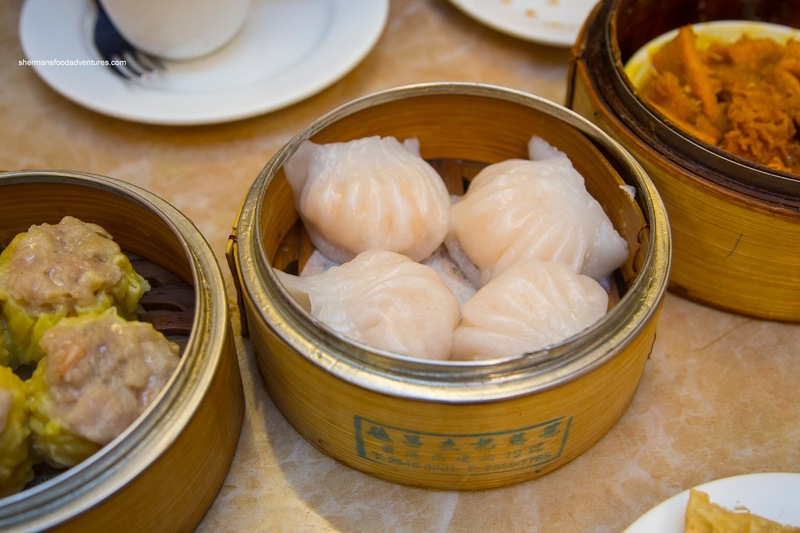 For the kiddies, we got the Lo Mei Gai as per usual. This consisted of 2 medium-sized portions rather than the 3 found at most places. As such, there seemed to be more filling due to its size. It was necessary as the rice itself was chewy with minimal moisture. Flavours were mild though with natural pork sweetness. Once again, we had part of our dessert with the Custard Buns midway through the meal since it was in the push cart. The actual bun was medium density where it was slightly fluffy. Inside, the custard was rather stiff and clumpy while easy on the sweetness. 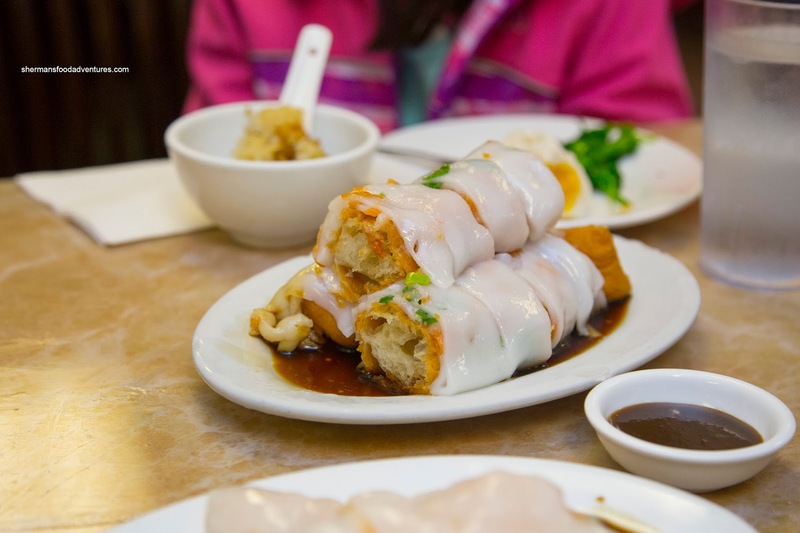 Other than the spring rolls, my son loves the Donut Rice Noodle Roll just as much. This particular version was okay. Crunchy, yet dense, the donut really needed the sweet soy to soften it up. 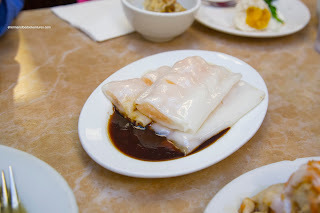 As for the rice noodle, it was somewhat thick, however, it was really soft. I would've liked a bit more resistance and elasticity though. For Viv and myself, we had the Shrimp Rice Noodle Roll. It featured even thicker rice noodles, yet again, it was super soft. Inside, there was a decent amount of shrimp filling which was not as mealy and mushy as the one found in the spring roll. Although not salty, the filling was pretty flavourful. Unfortunately, the most important dish of all was not properly executed. With a unappealing and thick dumpling skin, the Haw Gow was impossible to eat as one piece. The filling merely fell out of the crappy dumpling skin. 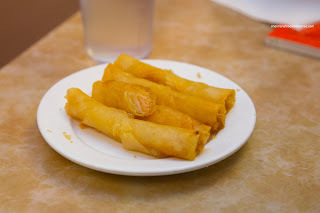 As mealy as the spring roll, the shrimp mixture did not exhibit any snap at all. 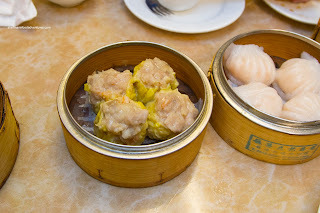 On the other hand, the Sui Mai was much better. Although the pork was not exactly "bouncy", it was meaty and tender. 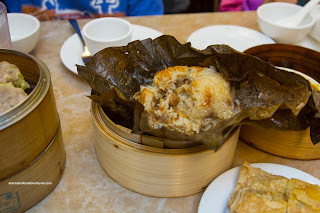 There was a good amount of shrimp and shiitake mushroom to accent the sweetness of the dumpling. 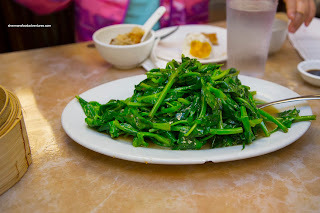 For our veggie item, we got apparently the large order of the Stir-Fried Pea Shoots. Apparently because they didn't indicate that when we ordered. It was so-so with slightly old pea shoots with chewy stems. 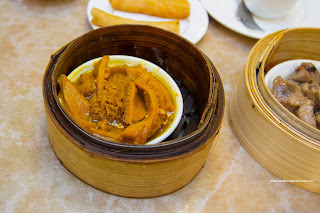 Yet, the most strange part was the starch-thickened oyster-based sauce. It was "interesting". 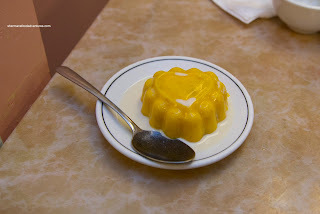 For the actual dessert, my daughter had the Mango Pudding topped with evaporated milk. It was light and jelly-like with artificial mango essence. Pretty typical version which more or less did the job. 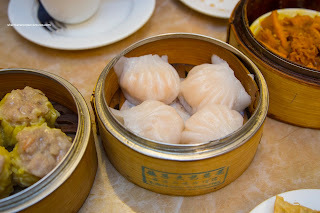 However, the Dim Sum service as a whole was mediocre at best. Sure, it is cheaper than the other spots nearby, but I'd be happy to spend more money for better Dim Sum.